One of the most consistent pieces of advice you’ll see about how to create a good (e)book is: make sure you get it properly edited. I have to agree (and I say that as an author who is currently in the process of re-releasing her ebooks because they needed to be re-edited). I also say that as a reader who is intensely irritated by mistakes in published works, however the book is published. I’ve come across many professionally-published (including traditionally-published) books that have errors in them. Spelling mistakes, grammar errors, missing or incorrect punctuation, clumsy wording… all these things make me want to take a red pen to my pristine paper book and post it back to the publishing house. Once in a book I can forgive; I understand that the book was created by fallible humans, but even that is disappointing. More than once? Come now. I expect more for my hard-earned money. I’ve read books where there’s an error in pretty much every chapter. Recently, I had to put a book down because it was so clumsily edited that the story was ruined for me (and it’s a rare thing for me to abandon a book once I start it). The poor editing was tripping me up so often that I kept losing track of the story; it constantly threw me out of the flow of the narrative and I wasn’t engaged with or enjoying it at all, so there was no point in progressing with it. 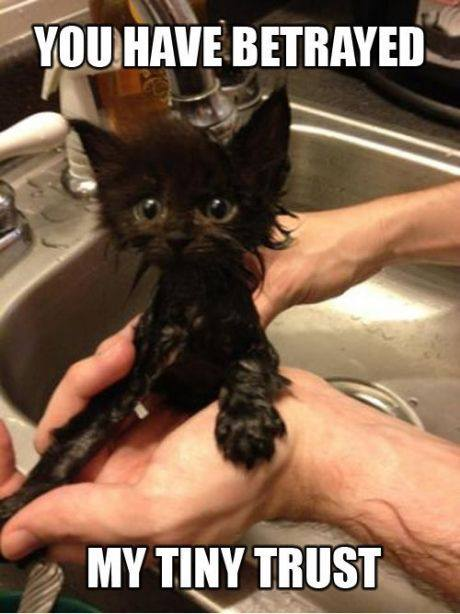 This is the face a kitten makes when writers allow a mistake to be published. The quality of the editing is a sign of care. If a writer cares so little about the presentation of their work that they’ll release it with multiple errors, should I care deeply about it as a reader? If they have been careless on this front, how much can they be trusted to take care of other aspects of writing? Will my tiny trust be betrayed? I’m the sort of person who notices these things, and they grate. They spoil stories for me, though the extent varies widely depending on how many mistakes there are. I know I’m not the only one; most, if not all, of my writer friends say the same thing. As a professional (technical) writer and editor, I weed these things out as part of my daily work and with a measure of professional pride. Mistakes reflect on my abilities and skill in my job, and they reflect badly on the company I work for if they should reach our customers, so it’s important to me to make sure my work is as clean and correct as possible. It’s a fact that it’s harder to edit your own work than it is to edit someone else’s. You’re too close to your own work to pick up the errors; your mind fills in gaps and smoothes off rough edges too eagerly. It takes distance and discipline to edit your own work well! With the web serial, it’s not always possible to catch everything before I publish a post. This is part of the price I pay for writing it on the fly and editing it entirely myself (with no gap between writing and editing). I have accepted that there will be the occasional error and I fix them up whenever I (or my readers) spot them (and I’m glad to say that they are only occasional!). I also plan to edit the stories thoroughly before they’re published as ebooks, so I’m not overly concerned if there are minor typos at the moment. However, I can’t tell you how mortified I was to realise that there were errors in one of my ebooks. I’m currently having an independent editor go over all of my books so that I can release fresh, more correct editions (which should be free for those who have already bought the ebooks). I wish now that I’d taken more care before releasing the ebooks, but hindsight is a wonderful thing. This is why I’ve had an independent editor go over the Apocalypse Blog ebooks. This is also why I’m looking at starting up an editing service, to edit others’ work and offer them the professional look and feel that readers expect from published works. I believe I have a lot to offer in this area. I love stories. I love making them shine as brightly as they can, and getting the mechanics of the writing correct is just one way to help that along. So just as soon as I get all my stuff together, I’ll put myself out there as an editor for hire, and see if I can’t improve the quality of ebooks everywhere, one corrected typo at a time.